Executed in 2008, the title of this work was taken from the first disk (front) No.1 Rotorelief by Marcel Duchamp. Lithograph printed in colors from three stones, a fine, fresh impression, the full sheet, printed on 300gsm Velin d'Arches paper, to the edges, signed, dated, titled and numbered in pencil on the reverse by the artist, executed in an edition of 45 examples (there were also 5 numbered artist proofs, 1 archive proof and three dedicated proofs) printed by the artist with the assistance of Rasmus Urwald, published by World House Editions, Middlebury, Connecticut, and Edition Copenhagen, Copenhagen, in fine condition, unframed. The Rotoreliefs reveal Marcel Duchamp’s taste for mass production on a modest scale, if you will. They were printed inexpensively in a large edition and were first presented to the public at an inventor’s fair in Paris in 1935. When viewed (preferably with one eye closed) at a rotating speed of 40-60 rpm, the disks present an optical illusion of depth and in a few cases, of three-dimensionality. 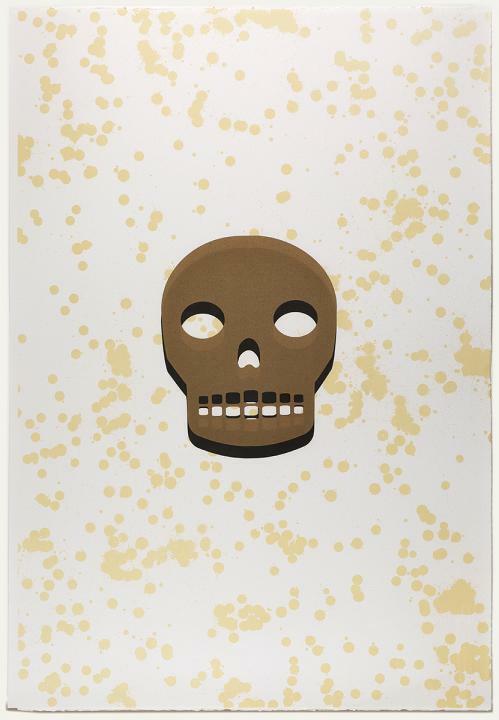 In the present work, John Armleder follows Duchamp's lead and coveys an illusion of depth in a very simple manner by shifting the stones just enough to create an overlapping of the skull image. This, coupled with a change of color to the second stone (skull) as well as the background "splats" (created by dripping hot wax from a candle from a height of about four feet onto the stone) engender an ephemeral sense of three-dimensionality and space.